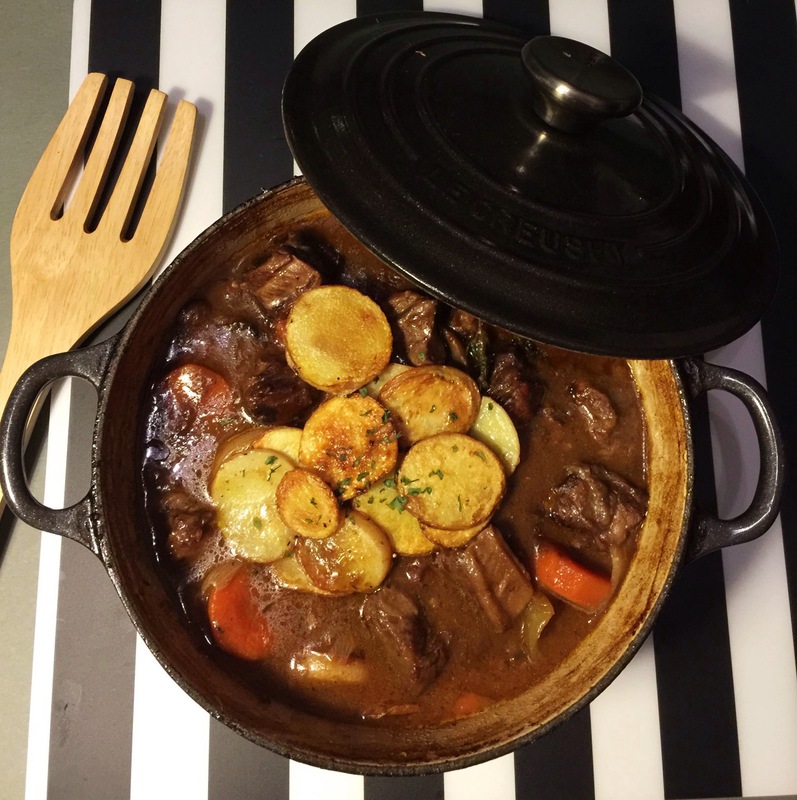 Boeuf bourguignon is a comforting, rustic French dish that always holds a special place in my heart. It is one of those classic recipes that is constantly evolving, modernizing and being reinterpreted. I mean, how often do you find a dish that is cooked in Burgurndy farmhouse as well as served on the table of Michelin awarded restaurant? Julia Child included a recipe of boeuf bourguignon in Mastering the Art of French Cooking- her famous cookbook. 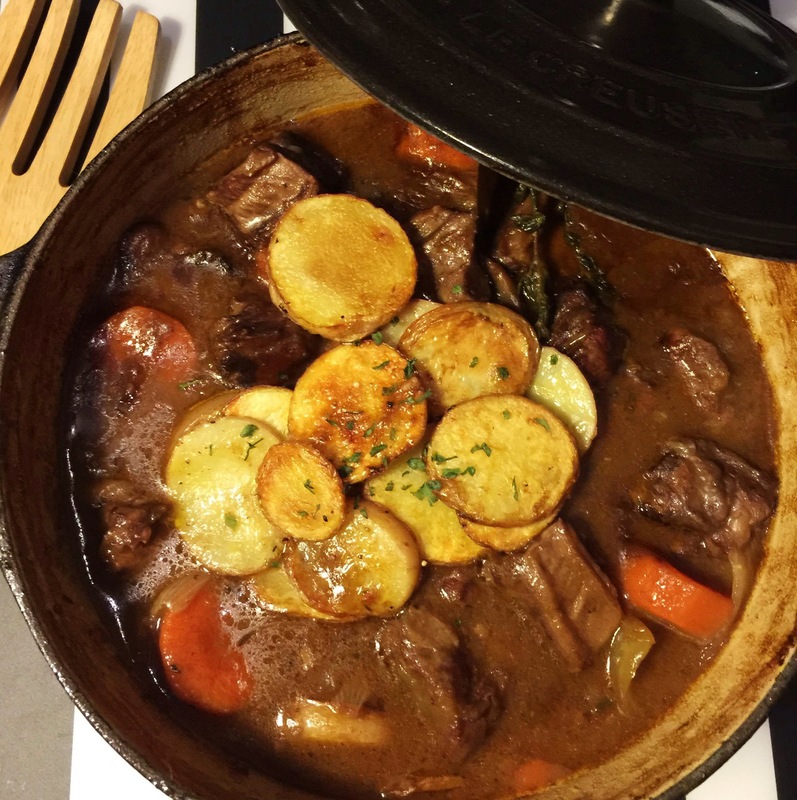 She described the wine-rich stew as “certainly one of the most delicious beef dishes concocted by man”. She also pointed out that this is a dish that benefits from a day in the refrigerator. “Fortunately you can prepare it completely ahead, even a day in advance, and it only gains in flavor when reheated.” Making it a perfect choice of made-ahead food before party, and the flavors and taste do become richer and more mature with time. Making boeuf bourguignon surely takes time and requires a lot of effort. But trust me, it is all worthwhile… imagine its meat shredding under the gentle pressure of your fork while its sauce a marriage of beefy aroma and wine. I wipe my plate clean with a piece of bread and lick my knife to capture the last drop of sauce every time I make this! 2. Remove the beef from the marinade. Discard the veggies and reserve the marinade. 3. Preheat the oven to 180 degrees C.
4. Sprinkle the beef with salt and toss with the flour; flour the beef right before when you are ready to brown it. 5. Add the flour-coated beef to the hot pan (many recipe suggests using dutch oven at this point, but I prefer using a non-stick pan for browning and leave the dutch oven to the next step) , may need to cook in batches to avoid overcrowding the pan. 6. Heat the olive oil in a large Dutch oven. Add the bacon and cook over medium heat for 10 minutes, until the bacon is lightly browned. Toss in the mushrooms, carrots, celery, garlic and onions, and season with salt. 7. Cook until the mixture starts to soften, about 10 minutes. 8. Then add the tomato paste and cook for 1 to 2 minutes. 9. Add the 3 cups of marinade and deglaze the pan, stirring up any browned bits, and cook for 1 minute. 10. Add the beef. Stir to combine and cook until the wine has reduced by half, which takes another 1 to 2 minutes. 11. Add enough of the beef stock to just cover the surface of the beef. 12. Add in the bay leaves and thyme bundle. Cover the pan, bring the liquid to a boil and put in the oven. 13. Cook the beef for 2 hours. 14. Check the pot one hour later as you may need to add ~ 1 cup of beef stock/ marinade mixture to keep the surface of the beef covered. 15. Remove the pot from the oven and skim off any excess grease from the surface of the stew. 16. Heat olive oil in a skillet on medium heat until shimmering and almost smoking. Add potato slices and let fry for 4-5 minutes or until the edges turn brown. Season to taste with salt and pepper. 17. Garnish the dish with potato and chopped parsley on top.